Guidance on Mentoring: What is Mentoring? This brief guide focuses on defining different aspects of mentoring, whether for an individual or for a team, and includes selected reference resources. It is critical that the mentee and mentor both approach their interaction with the same understanding of the nature and scope of the advising that will be offered. This brief guide can serve as a reference for both parties in arriving at that mutual understanding. Before delving into mentoring, it’s important to be aware that sometimes the terms “mentoring” and “coaching” are used interchangeably despite important differences between them. There are many resources on mentoring and coaching – and almost as many different definitions for each as well as the similarities and overlap between the two (such as shown in the articles on coaching in the resource list below). Also, most people agree that mentoring is NOT training although a mentor or coach may recommend that a mentee obtain additional training. What is the nature of the mentoring to be provided? · Technical mentoring: This is best served by being called what it is - training or education. It focuses on developing a specific set of skills. This is is usually done by a supervisor or internal technical expert who will help a learner put new skills into practice in a work setting, often using a process such as supportive supervision or on-the-job training or coaching. · Personal mentoring: This term is rarer; when it is used, it identifies an individual seeking out a mentor. Often, the personal mentoring needs may be part of professional mentoring (e.g., work-life balance, time management needs). I make a distinction between internal and external mentoring and I feel that this better helps mentees understand what they can expect from each type of mentoring. One is not better than the other as each type serves a different purpose and brings a different perspective. The external mentor has no relationship to the mentee’s work organization. An external mentor serves the mentee by being able to be the mentee’s advocate – and also the mentee’s critic and confidant. An internal mentor is a person from within the mentee’s work organization, almost always another employee. The internal mentor will know the organization and will serve mentees looking for mentoring on the specific organizational culture, for example, very well. One caution about internal mentoring programs. Mentoring in a work setting can be confused with supervision. Many organizations have mentoring programs, usually initiated or overseen by the Human Resources (HR) department. In my experience, though, senior managers and HR often target the supervisor to be a mentor - but not all supervisors are good at or want to be mentors. Most supervisors focus on and are comfortable with helping and supporting a staff person to achieve and advance in their specific work role. Supervisors are not as comfortable mentoring on professional development needs beyond the specific technical area. And mentees may not be comfortable, for example, telling a supervisor that their professional goals include working in another department or changing jobs out of the organization. Or mentees may reveal such intentions to an internal mentor when they should not. Where organizations implement mentoring programs which match mentors and mentees from across the organization, mentees may still feel uncomfortable (and rightly so) about sharing information about on professional goals even if a mentoring program value is the confidentiality of the mentor-mentee interaction. It is much more common now that mentees have both internal and external mentors, sometimes at the same time. My mentoring work is all as an external mentor and most of it focuses on job-related issues, i.e., “professional mentoring.” Many of my mentees have commented how helpful it is to talk to someone who isn’t involved in their work situation or direct network of colleagues. Even though I may not know much if anything about their work organization, I often have mentees who seek help with a work situation - and I can help them. In my external mentoring role, I work with them to develop a plan and sample scripts for the work problem such as the example in the box. · Identifying what Patricia should do for the next 2 days, the next week, and the next month. · Developing a priority list of her job responsibilities and identifying her technical work that needed to be delegated. · Specifying how Patricia should discuss work needs, the plan for delegation to other staff, and the support Patricia would need with her new supervisor. · Developing a plan for how Patricia should work proactively with her new supervisor and how to keep the supervisor updated/informed. In putting this plan into action, Patricia found that her new supervisor was also able to be her mentor in supporting Patricia to direct a project team and also to provide her with professional development guidance. Let me know - does this mentoring guidance resonate with you? Do you have a different perspective? Something to add? Please let me know in the comments. 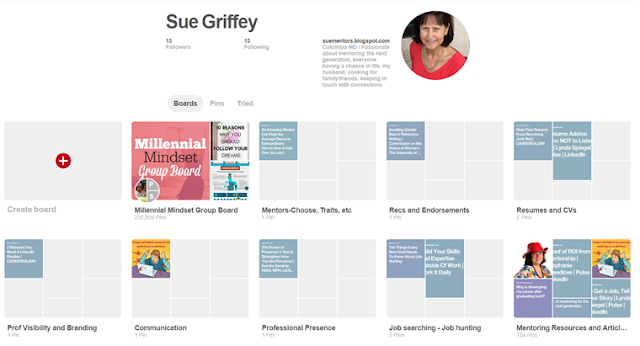 I have several Pinterest boards with a large number of articles on various mentoring topics in addition to the selected resources below. Great post! I am actually getting ready to across this information, is very helpful my friend. I’ll be happy if you continue this in future.for information regarding Career Counselling service please visit to the link.